Today, I was so honored to be nominated for a Liebster Award by Catherine Mullaney of Disarmed By Love. Thank you, Catherine. My first reaction was simply to re-read her lovely nomination to me; you see, I’ve been blogging for such a short time, and Disarmed by Love is such a lovely site. When I first saw this beautifully inspirational site, I knew that I would share it with some of my students. (I have already done so.) It is so appropriately named, for there readers are truly disarmed by the introspective pieces. We can learn to love ourselves and each other more there. If you could travel anywhere tomorrow, where would it be? I would travel to New York City. I have always wanted to go there. I recently had a bit of a windfall, and I think this will be a reality next Spring (fingers crossed)! I love theatre, music, museums, and interesting food. New York has all this in abundance. My husband, Carl. We have been together over twenty years, and we still hold hands, talk every day at lunch, and go dancing. I’m smiling as I type this. My hometown, Sevierville, Tennessee is where my family is. I was born very near here and teach in the school where I was once a student. Although some things (traffic) often irritate me, I love my family and the roots I have here. What is the best meal you can prepare? Ooh! I love to cook! I make biscuits that are out of this world if I do say so myself; I’d serve them to Gordon Ramsay. From there, I guess I’d go to the Southern breakfast. I can do eggs any way except poached (just can’t get those whites to cooperate), add a great breakfast meat, and yes, I can make gravy. Add some fried potatoes of your choice, and some fruit, serve with French press coffee, and Order Up! What’s your favorite chore to do at home? A favorite… Well, I’m a pretty awful housekeeper, but I’d agree with you; laundry isn’t bad. I, too, have lots of favorite books. It may sound odd since I teach it, but I truly love To Kill a Mockingbird. I must have read it a hundred times, and I still enjoy it. I can’t imagine any other book that would not have worn tired on me by now. What’s the very first thing you would do if you won the lottery? Pay off everything for us and my family and go to New York. Then go to London. Fresh tomatoes hands down! I even have a favorite variety: Mr. Stripey. Once…truly. My husband Carl. We met in college. He was my partner in dance class. It was actually love at first sight. We refused to trade partners when the teacher called it out. We’ve been together for over 25 years now. What was your favorite game or toy as a child? My Barbie dolls. I loved those things! I had Barbie’s town house, her jet, her stage. I had two Kens and a Skipper. By the way, Barbie’s full name is Barbra Millicent Roberts and Ken is Ken Carson. Hot tea! Right now, I’m especially enjoying the Paris tea from Harney and Sons. What’s your least favorite chore to do at home? I hate any outdoor chore, mostly because they are summer chores, and I can’t stand hot weather. What’s your favorite animal and why? I love cats (with dogs running an almost imperceptible second) because they are so independent, so the relationship we have with them is more like a friendship. Who is your greatest hero or inspirational figure? My maternal grandmother inspired me in my determination to teach and shaped the way I teach and live. She told me when I started teaching to always be kind because kids already have enough people to criticize them. I had a difficult time selecting the blogs to nominate myself because I have been overwhelmed by the quality and variety of emerging blogs. But below are the blogs I am nominating. 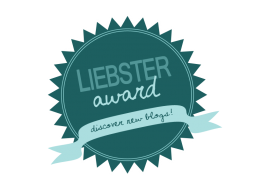 Blabberwockying– This was one of the first blogs to come to mind because the Liebster Award is not only about having a great blog, but also about fostering community, and Anand is one of the most involved and supportive bloggers I have encountered in my short life in the blogosphere. Afthead is one of the first blogs that inspired me to work and strive to be more creative. This quirky site about writing and life is beautiful. Be Zingy: This aptly named site is inspirational–another site I’ve sent some students to. The layout and photos make it look like it’s been around forever, even though it’s quite new. Those Who Teach: This is a great inspirational site for teachers– often in need of inspiration. Not That Kind of Teacher– I immediately saw a soul sister when I found this site. This teacher is interested in improving education and in sharing her innovative views. She wants to help more of us become not the kind of teacher that just walks through the day. Good for you. Loved seeingyour answers, I also follow a couple of your choices and look forward to seeing how they answer your questions! Thank you! I’m curious too! Congrats on your award. I’m proud of you! I too have discovered that I adore To KIll A Mockingbird. I discover new things about it each time I read it. Are you going to read Go Set a Watchman? Well, eventually. I’ve written a post about why I’m not too excited about it: Atticus the Dark Knight. I liked reading about you especially your love life which is frankly quite amazing! Love at the first sight and soulmates forever–so romantic and beautiful! You can belch at command–this would surely make kids laugh. Hahaha 😀 I have seen some friends do this. I would try to return the favor by nominating a few other bloggers soon. I want to know how to copy the badge to a post? I saw that you got it there. I’m sorry I’m so slow, but it’s back to the grindstone for me. I get my kids in class on Monday; I’m excited! I loved reading your answers. I also found it interesting that you are from Sevierville, Tennessee. I attended Lee University. It used to be Lee College and began in that area. Oh, yes. I’m very familiar with it! That is really neat! Tracey! Thanks so much for the nomination. I adore that you said I inspire you and that I’m quirky. I also loved learning more about you and am excited to answer your questions. Please, please share your biscuit secrets on a blog sometime, and if you already have, point me to it. I adore biscuits, but mine tend to come out like dry chewy masses. Not good. You must go to New York at some point in your life. I have also spent some time in the Knoxville, TN area. It is so different from my hometown of Denver, CO, but so beautiful. Is that near you? Off to write my response. Thank you again! Nomination paid forward. Thanks again Tracey! I am about 35 miles from Knoxville. It is the nearest metropolitan area to me. The downtown area is very nice. If you were there very long ago, they have revitalized it, and they have lots of cool restaurants there now. I really liked Knoxville the couple of times I’ve been there. It’s nice to put a place with a person. I have nominated you for Premio Dardos award Tracey. Please have a look. Thank you so much! I’ve just started reading some of the blogs you mentioned that I was not already familiar with. I’m so honored to be included with them! Glad you liked it Tracey. How is school going on? I have a great schedule, and I’m excited to be working with a great teacher in a combined studies class.